It takes a lot more to prevent litter box smells than regular cleaning. Of course cleaning a litter box frequently is important, not just for keeping smells at bay, but to help your cat maintain top hygiene and health. That being said, if keeping a cat’s litter box clean was the only thing necessary to keep terrible smells away, hardly any cat owners would have issues with litter box smells, and this sadly doesn’t happen to be case. 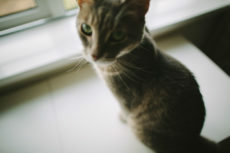 There is absolutely more to stinky litter boxes than mere cleanliness, the specifics of which I’ll be getting into today. I remember the days when I had issues with litter box smells. 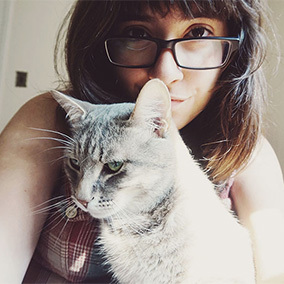 Truth be told, my issues with smelly litter were nowhere near bad even then, but I still had a long way to go before I got to this point, where living in a studio flat with my cat’s litter box in the same room I work, sleep, and hang out in, I still rarely notice it at all. Now that the days of smelly litter are long gone, the only time I’m reminded of them is when I someone posts a comment to this blog about cat smells, a rare phenomenon indeed because I think most cat owners figure out some sort of system for reducing litter smells on their own over time, meaning it’s those who have newly adopted or are thinking about adopting that typically bring up cat smells. Regardless of whether you’ve got a little odour or an ungodly stench radiating from your cat’s litter box, know that your situation can be dramatically helped. 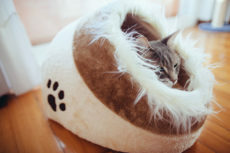 There are plenty of things you can try out – so it’s easy to pick and choose which options suit you best (based on cost, ease, and what’s ideal for your cat’s well being). 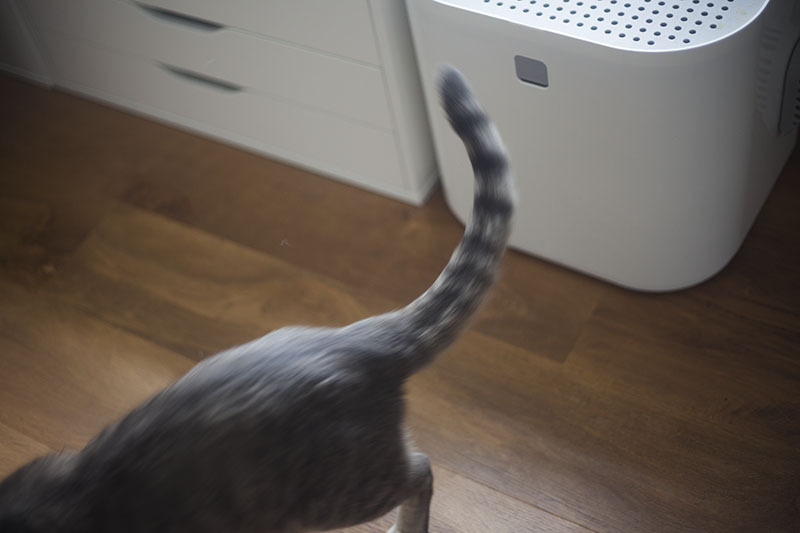 It may take a little trial and error at first, but once you’ve found your ideal system, a good combination of cat food + litter + litter box + room odour reducers, you’re set for life and those terrible litter smells won’t just be temporarily reduced, they’ll be forever kept at bay. “Smelly cat, smelly cat; what are they feeding you?” Words of wisdom to take to heart from none other than Friends‘ Phoebe Buffay. You wouldn’t believe how much certain types of cat food make a cat’s bathroom use seriously stink. Changing from one cat food to another can dramatically reduce stench from a litter box, and I’d argue is strongly correlated with how terrible or tolerable any smell wafting out of a litter box may be. In my experience, most kibble makes a lot less of a stink than wet food. And most fish-based foods give off a more tolerable odour than chicken/poultry based cat foods. But I could be wrong, your mileage may vary, and of course, each and every single cat food has a different formula, so there may be a number of exceptions even if these do happen to be true overarching rules. I am certain there are many wet foods that don’t leave you with terribly smelly restroom uses, I just haven’t tried all that many myself, and so would not be able to recommend any. As far as kibble goes, I used to feed Avery Blue Buffalo back when we were living in Canada. I started with Chicken & Brown Rice, since that’s what the cat I was house-sitting when Avery (as a stray) wandered into our lives. I wasn’t the biggest fan of the smell, though it wasn’t so bad. Instead of switching to something completely different, I tried Blue’s Salmon & Brown Rice formula, and loved it. When we initially moved to the UK, I had to switch Avery onto a new cat food (couldn’t get a hold of Blue products affordably here in the UK). In terms of smells, it was fine, but after a few months on that cat food, Avery developed a problem where he threw up bile on an empty stomach. 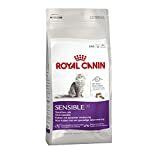 I switched over to Royal Canin Sensible, which luckily completely resolved the issue, and I’m still using this cat food for him today. I have zero complaints about how this cat food makes Avery’s restroom stops smell either. I mention all this not to say that you should switch cat foods, but merely to point out that what your cat eats makes a difference. 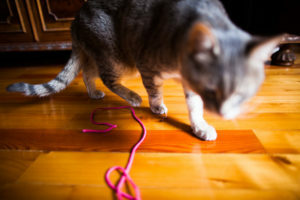 Would I advise changing your cat’s diet as a litter smell reduction method? Not particularly, and not at all if your cat has any sort of health problem or has developed health issues resulting from cat food in the past. The why is obvious: health first, before all else, reducing smells should never be the priority. Switching to a different formula by the same brand. Like one made of fish instead of poultry, for instance. Switching to a similar formula by another brand. Like from a chicken diet from one brand to a chicken diet on another brand. 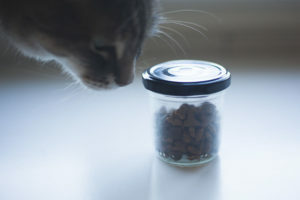 I think it’s best to switch to something as similar as possible (in terms of brand or in terms of formula), in case you’ve got a cat food that’s working well for your cat and you, but litter smells are the only issue. Would definitely recommend only trying this after you’ve tried other options first, as those options don’t have as much (if any) potential impact on your cat’s health. Also, the other options have a very good chance of doing the trick in reducing or eliminating litter smells by themselves, without you needing to alter your cat’s diet at all. While cat food has an enormous impact on litter smells, the cat litter you use makes even more of an impact based on my experience. There are some god awful cat litters out there, and yes, they’re usually the cheap ones. 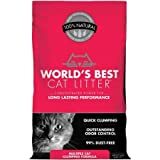 Sadly, it’s not the best clumping, best odour reducing litters that are at the bottom of the price comparison charts, and if you have a lot of cats, it can certainly be a little on the pricey side trying to reduce litter smells this way. But if proper cat litter box smell reduction is important to you, I firmly believe it’s worth the investment to try changing cat litters. I could be wrong, but in my experience, clumping is very important when it comes to reducing urine smells from litter boxes. Think about it this way: if you’ve got a litter that doesn’t clump at all, or doesn’t clump particularly well, you’re almost guaranteeing you’ll be leaving pieces, sometimes very large pieces, of cat urine in the litter box after every cleaning. Over time, this would compound to give you a really stinky litter box. 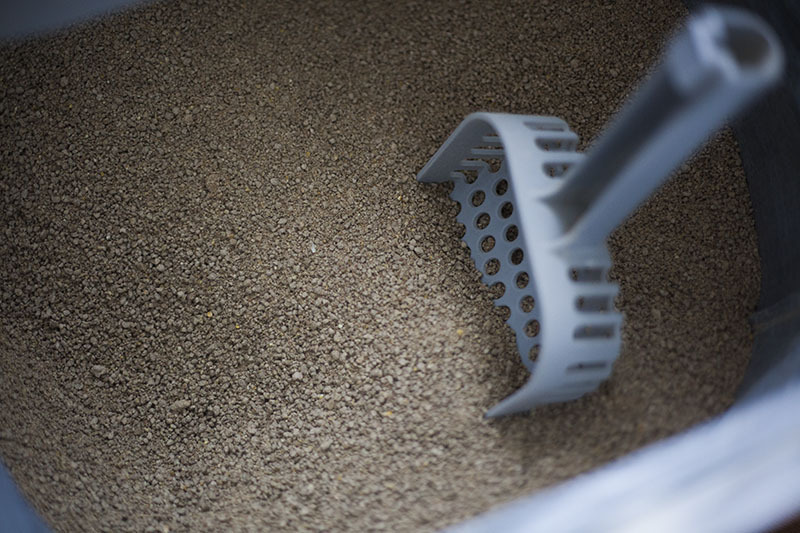 So if you have the choice between a better clumping and poorly or even non-clumping cat litter, in my opinion, it’s best to choose the litter that clumps best if reducing urine smells is important to you. The worst offending cat litters in terms of odour reduction in my experience are wood chip cat litters. I tried them just once and cannot handle them from a smell perspective at all. If you know of a way to reduce smells with these, let me know, but in my experience they’re impossible. Clay clumping cat litters are somewhere in the middle of the pack for smell reduction. 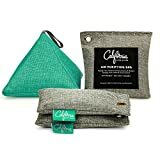 They’re cheap, quite good at clumping (especially when you consider price), and though they can be annoying insofar as tracking goes, this is easy to reduce with a quality litter mat, or with a top entry litter box. As far as budget options go, I can’t say you’re likely to find much better. The #1 type of litter for smell reduction in my experience has been corn kernel clumping cat litters. 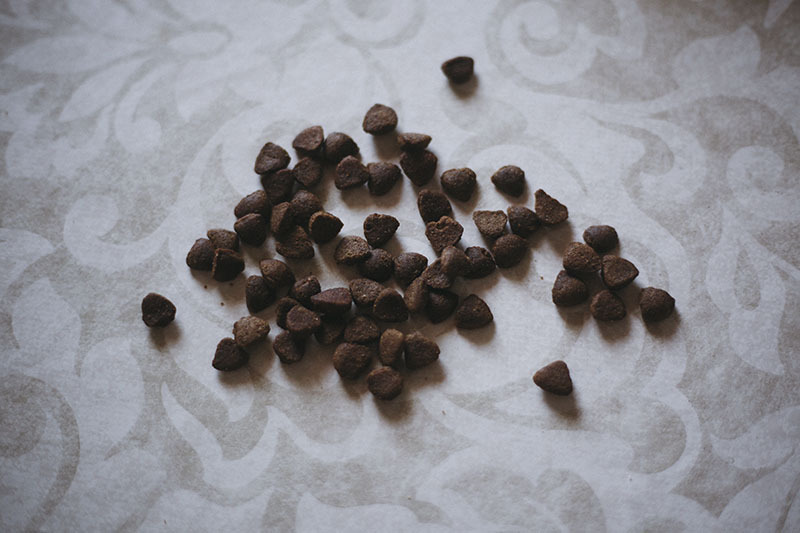 These are not as good as walnut clumping litters at reducing poo smells, but at reducing urine smells – well I don’t even remember what cat urine smells like, and that’s saying something because if I recall correctly, I often used to say cat pee smelled infinitely worse than cat poo. Now, this may in part be down to Avery’s diet change. As mentioned before, I did change his food since I couldn’t get the same food I had Avery on in Canada. But I’ve changed Avery’s kibble, and before and after the change, the smell when he peed was the same – completely unnoticeable. Take a whiff in his box and unless there’s a #2 somewhere in there, all you’ll smell is corn kernel. I’ve tried a few different litter scents, and while they’re good at masking smells sometimes, no extra smell really beats a proper litter. That being said, grabbing a scented litter can be pretty helpful, so long as you’re a fan of the scent being added (otherwise, you’ll just end up with two scents you hate coming out of the litter box). Definitely an option to try since scented litters are usually the same price as non-scented formulas by the same brands. I’ve developed the habit of buying multi-cat formulas over “original” or regular formula litters, even though I only have one cat and the multi-cat formulas are more expensive. I’m not sure if it’s a placebo or not, but I do feel multi-cat formulas are better at clumping, and reducing litter smells in general. Again, I feel like these are better for clumping and reducing smells, but I’m not sure if this is just me, is a complete placebo, or if it’s actually the case. If you have experience with testing any multi-cat formulas versus regular formula litters, let me know in the comments if you found there’s any difference. Many pet owners will put a dash of baking soda into the bottom of their cat’s litter to help reduce smells. Does it work? It seems to! And while it probably won’t be enough of a smell-reducer on it’s own, it’s certainly one cheap, easy, and extremely non-toxic way to add that extra little bit of smell reduction you may feel makes all the difference. If you use this trick, let me know how well it works for you in the comments! Do also let me know how much you put in, as I’m curious to know what the general consensus is! Some cat litter boxes really do help you reduce smells. If you have any recommendations for litter boxes that are excellent at reducing smells, I would love to know! Please leave your recommendation down below in the comments. 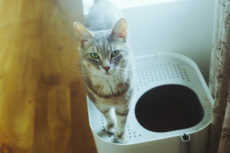 It makes sense that the more there is standing between you and what’s inside your cat’s litter box, the less stench you’re likely going to experience. Have an open litter pan? 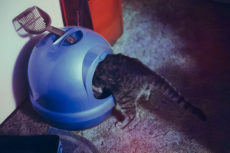 While these are excellent litter boxes from a cat’s usability perspective, they’re – for obvious reasons – the bottom of the barrel when it comes to smell-reduction on a litter box level. Want the best of both words? Highest usability and feline comfort + a lot more smell-reduction? 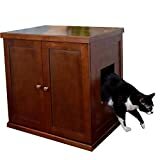 Try putting your open litter pan inside furniture designed to hide litter boxes, like the Designer Catbox Litter Box Enclosure or the Refined Feline Refined Litter Box. Willing to change out your litter pan completely? 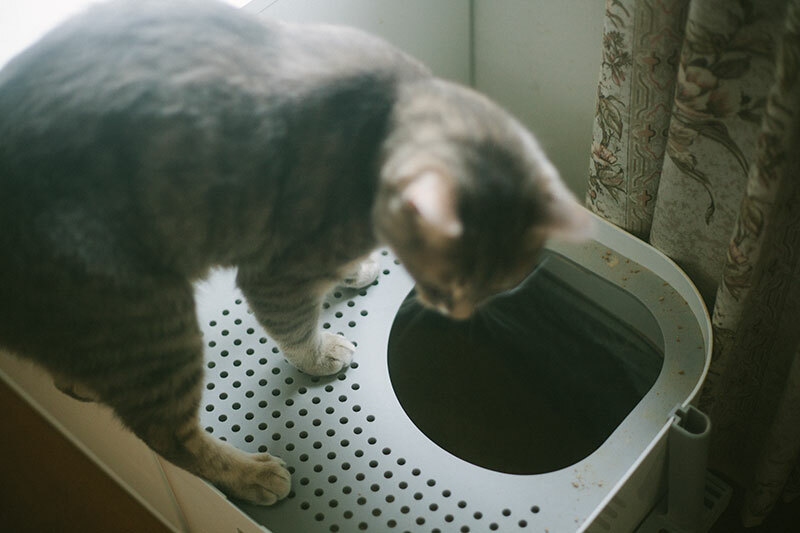 Grabbing a covered/hooded litter box with a flap should do a lot toward helping you reduce bad litter smells. The vast majority of covered litter boxes come with carbon filters for smell reduction integrated into the top of them. If you find these help, make sure to buy a few refills. There are plenty of carbon sheets available you can cut to size, even if your litter box has an oddly shaped filter. Personally, I haven’t found that a litter box’s carbon filters help all that much with reducing smells, and certainly not as much as any of the many options I’ve tried to outline here, but your mileage may vary. 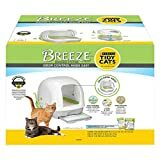 If you have issues with litter box odours specifically because you find it hard to consistently keep the litter box clean, you may want to give automatic, self-cleaning litter boxes like the Purina Tidy Cats BREEZE Cat Litter Box System a try. 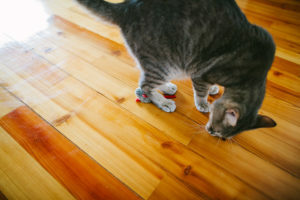 They’re not only likely to save you from a terrible stench, and make your workload a lot easier, they’re also great for your cat, since he or she will always find a clean kitty restroom. 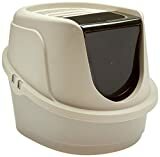 For the most ideal odor-reducing option I can think of: an automated self-cleaning litter pan like the hoodless Petsafe Scoopfree placed within a hidden cat litter box like the Merry Products Washroom Bench. I can’t think of a more viable option for effortlessly combating smells by switching up litter boxes. When it comes to cleaning the actual litter box, as likely will need to happen ever so often (say because your cat happened to urinate directly onto it rather than onto the litter itself), white vinegar is an extremely powerful solution. It’s extremely safe and non-toxic to cats, which is immensely important for litter box cleaning, as particles of whatever you clean a litter box with will almost certainly get into the litter itself, only to be ingested by your cat when he/she cleans directly after use. But on top of that, the acidity of vinegar actually neutralizes the salts from dried urine stains, making it more effective than most at neutralizing pet urine smells. Safe, cheap, and ubiquitous, there’s really no downside to using vinegar, not just to clean the litter box, but anywhere pet smells spring up in your house. 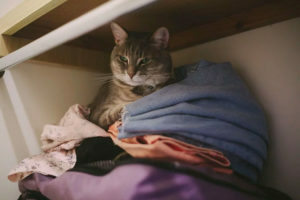 There are a few different things you can do to reduce litter smells when it comes to the room you choose to place the litter box in as well as a few things you may choose to have in it as well. Let’s get into them. 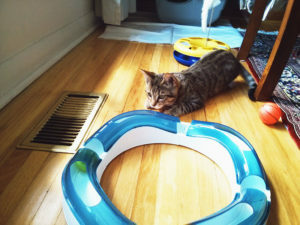 Where you place a cat’s litter box – which room, how open the space is, how hidden away, and how well ventilated the space you choose happens to be, all makes a quite a big difference in how much you notice litter smells, how much they linger, and therefore how much they will bother you over time. Have a large house with great ventilation? My guess is that you’re a lot less likely to worry about litter smells overall. Bothered by cat litter smells? 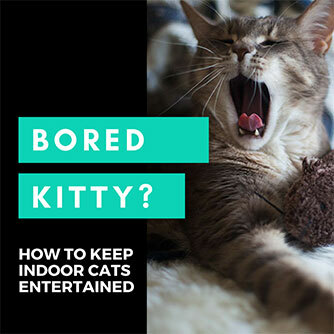 You can simply move the cat’s litter box to a location you won’t notice it so much, like a garage or the basement. Live in a small apartment? You’re likely going to have a lot more of a struggle with litter smells and need to be a lot more choosy about where you end up placing the litter box – as chances are no matter where it’s placed, you’re going to notice it at least a little bit. 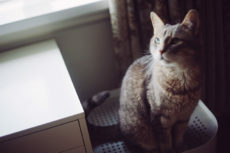 If you need a few ideas with regards to litter box placement in not-too-big spaces, check out my article on where to keep a litter box in a small apartment. Don’t be afraid to move your cat litter box around to different spots in your apartment to see if one place works out a lot better for you than another. 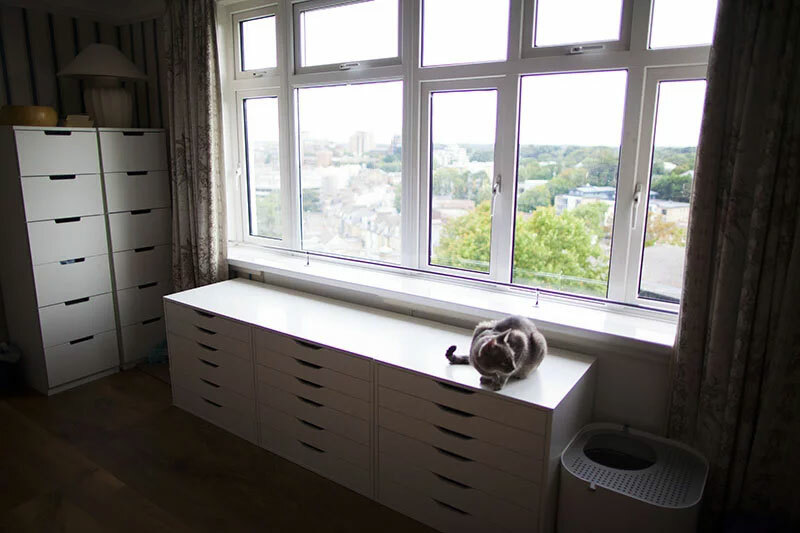 And if you’re tight on space in the room you’d like to keep your cat’s litter box, but are willing to change the box entirely, check out these litter boxes ideal for small apartments. If you can’t or would rather not flush your litter down the toilet, but you also find it difficult to take the litter out immediately after scooping, I’d advise getting your hands on a cat litter odour control bin, like the Litter Genie Plus. This particular pail seems to have so many glowing reviews from pet owners, I’d find it hard to recommend an alternative. Yes, they recommend you buy refills, but if that’s out of your budget, you can always do what this reviewer did – make hacked versions out of cheap 8 gallon plastic bags yourself. There are a few different things you can do to tackle litter odours that linger in the room. The best and simplest solution – crack open a window. Cat litter box in the bathroom? You can also leave the bathroom fan on a little longer than usual each day to get some smells out. Besides common bad-smell remedies like lighting a candle or some incense, or using odour eliminating sprays on fabrics, you can also try grabbing a large charcoal deodorizer for the room with the trouble. Have any other other odour-fighting tips and tricks for rooms? Let me know your favourites in the comments below! Have You Ever Had Issues With Cat Litter Smells? Ever had issues with cat litter boxes with regards to the smells that come out of them? Did you find a way to fix this problem? How did you do it? Can you think of any methods of reducing litter smells that I haven’t mentioned here? What methods in your opinion work best? Would love to hear your thoughts and experiences in the comments down below! Sounds like momma’s a ninja with the scooper! 🙂 I’m surprised the litter smells like sawdust when you add “water” to it! Mine certainly didn’t! Maybe I ended up grabbing a terrible one, haha. Thanks so much for letting me know how things work in your home! I don’t like to use scented litters. Cats noses are so sensitive and then they have to lick the stuff off their paws so it seems mean. I am glad the new food is working out well. That’s a good point about the scented litters. I have gotten ones that are very faint scents in the past, like “Alpine meadow” – but I’d be hesitant to use things like lavender that are really potent. I think you’re probably right, though, it most likely is more comfortable for cats to have non-scented litters. Didn’t think about it that way! Am really relieved about the new cat food as well. He’s been on it for months and months now and no issues, so I couldn’t be happier.